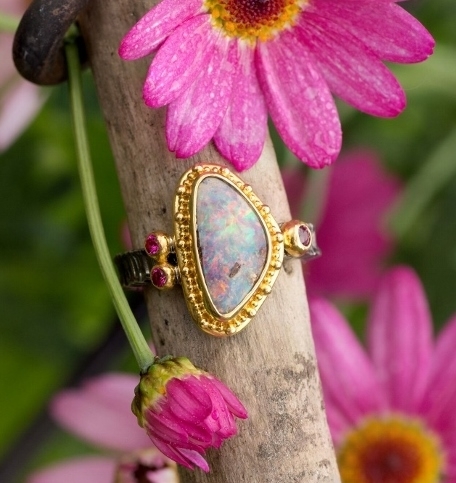 This hand crafted ring is set with a stunning Australian boulder opal set in 18Kt and 22Kt yellow gold. The design around the bezel setting is called granulation. 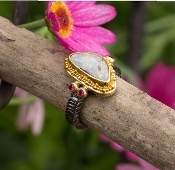 Granulation is a jewelry technique dating back thousands of years ago in the regions of Italy and Greece. This process of granulation is where the jeweler applies round spheres onto the setting and then heats the entire piece at high temperatures in order to create a permanent bond. The band is forged oxidized sterling silver.